The culmination of our 10th Anniversary Celebrations and the Sanctuary’s Social Event of the Year is our much anticipated 2016 Thoroughbred Ball at the RAC’s Woodcote Park in Epsom on Saturday 10 December. Our fundraising attention now focuses on the 2016 Thoroughbred Ball. This prestigious event offers you and your family and friends the very best of fun and entertainment in the run up to Christmas. We have secured a fantastic venue for the ball this year, the RAC’s Woodcote Park in Epsom. For full details of the event, please visit the dedicated website for the ball. To book your tickets, please call Julia on 01483 428961; or e-mail info@racehorsesanctuary.org. Early bird prices: As a special offer until Thursday 10 November, we are offering inclusive tickets at £100 per head – so act promptly and order NOW! As ever, desperate last-minute efforts by a dedicated team presage a fantastic day at Sandown Park enjoyed by all our supporters and friends able to join us on a mid-September Wednesday. 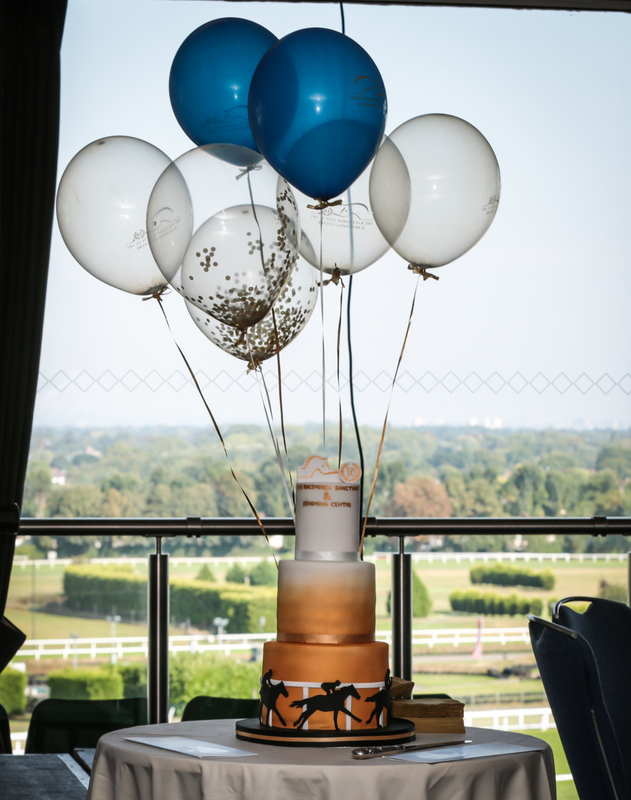 We had great weather, which made for wonderful viewing of the racing from the Solario Suite balcony, the icing on our 10th Anniversary celebration raceday at Sandown Park. The champagne reception set the tone for the day; lunch was enjoyed in the Solario suite by 120 guests, regaled with racing tips by Colin Brown, who then compered the live auction, with items ranging from a holiday villa on Mustique to a day behind the scenes of Doc Martin, with walk-on part, which was hotly contested. With heads-and-tails as the ice breaker, raffles, the silent auction, trips to the parade ring and the sale of merchandise, the charity netted a very welcome £30,000 towards the cost of looking after our horses. A great day was had by all, but we have to record our thanks to so many people for their generous support and encouragement, not least our major partner and sponsor, chartered Financial Adviser Max Patel of SJP, but amongst others also Sue, Val, Linda and Victoria, Julia and the team at Stilemans and the members planning committee. Thank you so much to you all. Quieter this month, but not necessarily a bad thing: BK chills out and meanwhile Blossom is lead astray. With thanks to Graham, for his great Facebook posts. BK, aka The Betchworth Kid, is caught on video relishing every moment of his role in the mud! This Facebook post generated over 50 likes. Sarah is fostering Blossom for us in North Yorkshire. 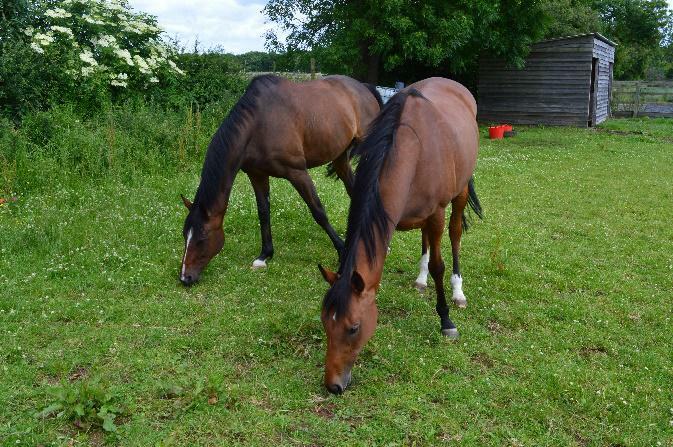 Here is a picture of Blossom on the right with Rupert, Sarah’s 11-yo gelding. They are great friends and you would not think butter would melt in Rupert’s mouth – but you would be wrong. Rupert has taught Blossom a new trick - to tip the wheelbarrow over when Sarah is poo-picking the field and then run away! Sarah is not so sure now, that he is the best role model for her. Our 2016 Christmas Card is now available to order. 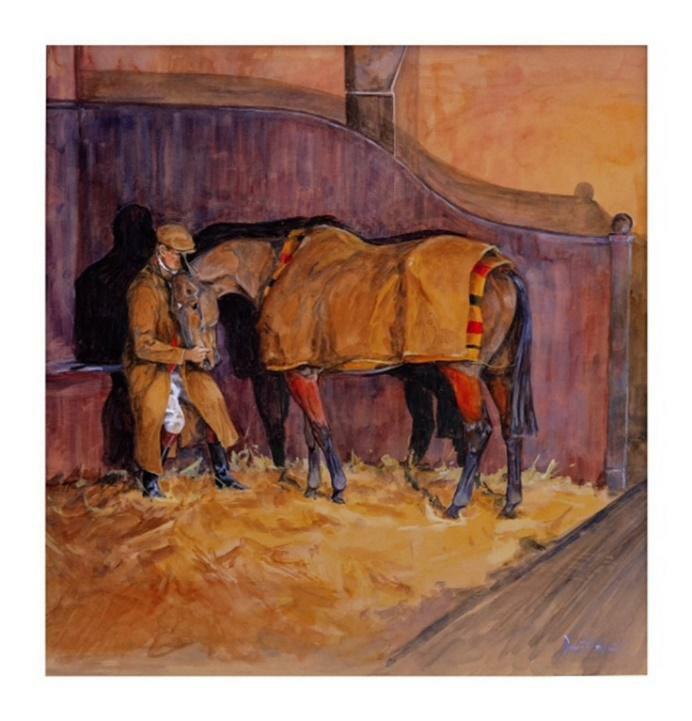 Popular sporting artist Daniel Crane has very kindly allowed us to use one of his wonderfully atmospheric horse paintings for our 2016 Christmas card. The price of the cards is £10 for a pack of 10 cards, including packing and postage. Do not delay, act now to avoid disappointment. Support from Tom Gretton Racing at Worcester and recent events raising funds for The Racehorse Sanctuary. Tom and Laura Gretton sponsored a race at Worcester Racecourse on Monday 12 September: Tom Gretton Racing Supports The Racehorse Sanctuary Handicap Chase over two and a half furlongs; the race was won by Bandol, an 8-yo bay gelding by Zargreb. 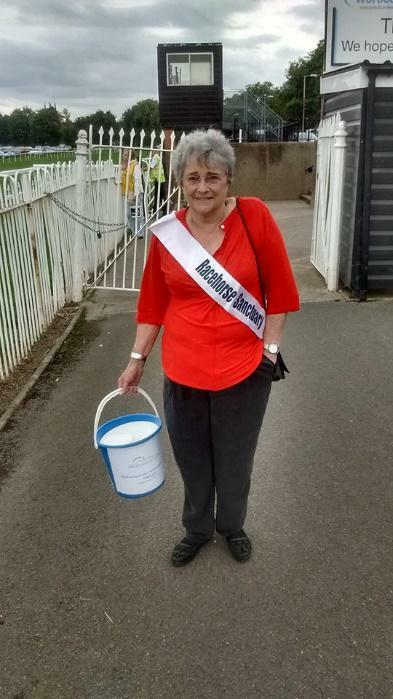 Jenny Cheshire, Executive Director of the racecourse kindly invited the charity to take a bucket collection after racing, which raised £280 – thank you collectors. This month the Sanctuary has also been one of the charities to benefitting from the Captain’s Charity Golf Day at Cranleigh Gold & Country Club, as well as from Wildwood Rocks 2016 at Wildwood Golf & Country Club. Thank you so much to all concerned.